Partners – Share Your News! Advocacy efforts vary…from organizing a rally to talking one-on-one with local or state officials, we want to hear what Partners are doing to improve systems for people with disabilities! 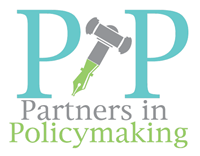 Partners in Policymaking graduates are making differences on many levels. If you are a graduate and have advocated for community inclusion, accessibility, inclusive education, equal opportunity employment, civil rights, or social changes in attitudes and values, tell us so we can share your success. Thank YOU for helping us keep Partners impacting Policy in Virginia and across the country. Once your information is submitted it will be reviewed by the PIP program manager and may be edited for use in VBPD materials and websites. By submitting photographs, digital images, video, or audio tape, you consent to their usage by VBPD and understand that submission does not guarantee the material will be used. You may be contacted for additional information, so be sure to list your direct contact information in case we have questions!